It took awhile, but some of the Paradise survivors have donned their yellow vests and are speaking out about the tyranny of their government and torching of their town and state by the Deep State and want to separate. They are calling for “mass yellow vest revolt” and stand in support of the French people. They know about Agenda 21/2030 and the depopulation plan. If you didn’t see the post at State of the Nation yesterday, do take it in. GWEN is the missing link and her fingerprints are all over it. If the People are awake now, Paradise should soon be glowing neon yellow—and the rest of California, with it. Organizing vast numbers of resistant people can be unwieldy (don’t we know it! ), so perhaps a smaller group can mobilize, fight the apathy and ignite the rest of the State by setting the example. They don’t have to know exactly HOW the mass murder was engineered—just that it was, and take it from there. There must be an official investigation to identify the perps. 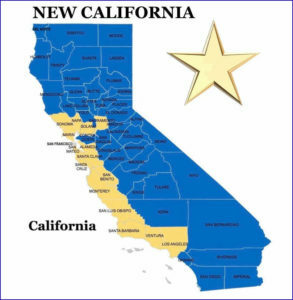 They should be ousting the corrupt government anyway so I hope they will band together, hold demonstrations and educate their fellow Californians as part of The Great Awakening. This is the spark. 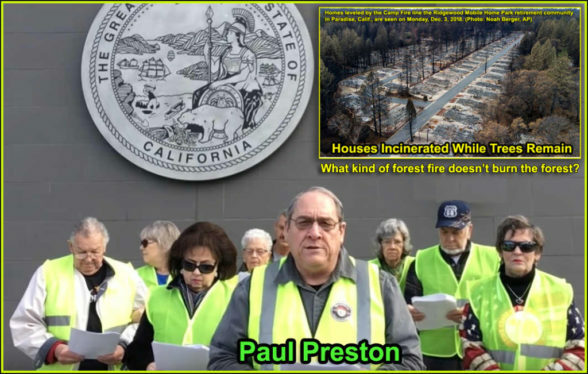 In the community of Paradise over 2,000 buildings were destroyed and up to 600 people may be missing including the leadership team for the NEW CALIFORNIA STATE MOVEMENT from Butte County. The town of Paradise, CA has served as one of the central locations for numerous meetings and town halls. Now the churches and residences along with the community of Paradise, are all destroyed. 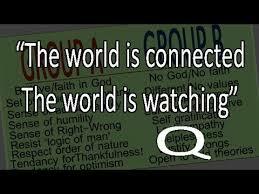 This entry was posted in Uncategorized and tagged agenda, Agenda 2030, Agenda 21, arson, Butte County, California, fires, fraud, globalists, GWEN, immigration, inalienable rights, independence, Insurrection Act, love, mass murder, microwaves, New California, new world order, Paradise, Paul Preston, Politicians, Q Yellow Vest in Paradise, revolt, secession, smart meters, Starship Earth, state grievance, torching California, totalitarian., Yellow Vests.. Bookmark the permalink.